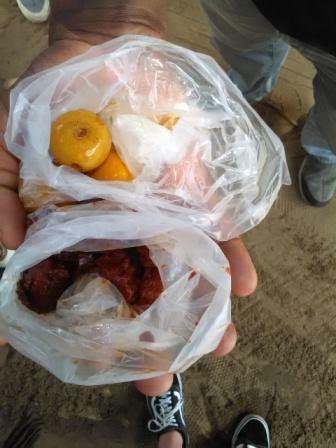 Featured image: Preserved dunks (Olijf) and almonds fruit (Mope) sold in parlour in Maroon village. Not being conversant in Dutch, Dr. Polar left the room and began searching for plants around the building. “This spinach (Amaranthus dubis) is edible ”, he said. “The wild carilee (Momordica charantia) also produces an edible fruit while the noni (Morinda citrifolia) has medicinal properties. Korsoewiri, Lantana camara encourages more butterfly species which can reduce the level of pest caterpillars on crops and this plant (Mimosa pudica), which closes when you touch it, can be used as an indicator of nitrogen poor soils.” The local representatives nodded in agreement but were surprised by one relating to Lantana camara. “The point I am making is that if we are to promote backyard farming in Moengo we should not neglect local knowledge and should utilize plants which grow naturally than force ourselves to grow things which do not easily grow”. The intervention was at stakeholders meeting in Moengo held under the Plan4Cure (Platform for activating networks for cultural resilience) project which aims to integrate heritage into planning policy as a way of sustainable development of urban and rural sites (i.e. Marienburg, Frimangron, Paramaribo and Moengo) in Suriname. Moengo is located in the Marowijne district close to the border with French Guyana. It was Alcoa’s first bauxite mine is Suriname but has been recently closed. The strategy for Plan4Cure would be to find economic strategies for Moengo to ensure its survival. The persons in Moengo are mainly Maroons who live in the urban centre or along the bank of the Cottica river. Oral accounts suggest that Moengo was a prosperous town until the civil war (1986 – 1992) where it was the stronghold of Brunswijk, who was fighting the de facto head of state (and current President), Bouterse. Today, it could be considered as a post conflict society struggling to rebuild. Moengo is also of possible interest because of its inland location, its existing road and river networks. This location should be evaluated as a potential area where refugees could relocate should sea level rise due to Climate Change cause the Small Island Developing States in the Caribbean or low lying areas on the continent to become submerged. The Plan4 Cure project is lead by the University of Antwerp’s Johan de Walsche, Sigrid Heirman, Dirk Laporte, Marleen Goethals and Filip Hanjou and by Anton de Kom University of Suriname’s Marciano Dasai, Hans Martinus and Angelika Namdar. The urban design students are engaging residents in planning processes in the targeted locations as a form of Problem Based Learning. Dr. Polar of the Caribbean Network for Urban and Land Management (Trinidad) and Lula Marcondes of the Universidade Católica de Pernambuco (UNICAP) (Brazil) joined the team to provide technical assistance. Dr. Polar presented the film “City on the Hill” which documented the built and cultural assets of East Port of Spain, Trinidad while Lula Marcondes demonstrated the emergence of a cultural revolution from the city of Recife, Brazil. The Plan4Cure work was divided into plans to enhance urban and peri urban agriculture, the arts and tourism. In the discussion on urban and peri urban agriculture, it was noted that some of the residents of the Moengo area would make their livelihoods through slash and burn subsistence agriculture in forested areas or engage in it if other employment activities were not available. These gardens often contain watermelon (Citrullus lanatus var. lanatus), cassava (Manihot esculenta), Antroewa (Solanum macrocarpon), bora (Vigna unguiculata) among other plants. It was also observed that most households had fruit trees (Almond (Terminalia catappa), cashew (Anacardiun occidentale), dunks (Ziziphus mauritiana), mango (Mangifera indica), breadfruit and chataigne (Artocarpus sp.) and only a few had vegetable crops. Some strategies were recommended to improve nutrition security and food security. Maroons have a tradition of sharing food with family and friends hence food security is not considered a major problem for many. In hard economic times, the lack of physical money may be a barrier to trade in goods and services. Hence, the traditional sharing of food should be encouraged to ensure it is not lost as it is known that urbanization often changes these traditional behaviors. Increasing food production around household is likely to reduce demand for forest land for cultivation. The easiest approach would be to convincer homeowners to plant another tree in their yard or to have a low maintenance backyard garden. Growing watermelons was said to be more economically viable than vegetables because of their longer shelf life. There is opportunity for processors, particularly those who make cassava/ banana chips, juices or frozen vegetables, to either sell produce in Paramaribo or encourage local use if tourism picks up in Moengo. The soils in Moengo are rich in bauxite but may lack the organic matter suitable for vegetable growing. Composting household food waste or mixing poor soil with organic material from the forest can improve fertility. Backyard gardens should focus more on ensuring nutritional security than economic returns. Planting fruit trees on unutilized areas in the town can provide nutritional security, economic returns and aesthetic benefits. There was a reluctance to impose a management structure for this given past experiences with co-operatives. Hence, allowing a management structure to evolve naturally may be the recommended approach. Mangoes, perhaps, would be a useful fruit to start with as these grow healthily in Moengo and are easy to propagate. One of the tree crops not observed in Moengo or the Maroon villages was Theobroma cacao (cacao). Dr. Polar had earlier spoken to Ellen and Rudger of Tan Bun Skrati (http://www.tanbun.org/), the only know artisan chocolate manufacturer in Suriname. They explained that the cacoa industry began in Suriname along the Suriname River where it spread to other inland and coastal areas. Cultivation of cacao began in the 1680s with the growing of the yellow Criollo and the red Caracas imported from Venezuela. After a promising start, production declined in 1750 and Forestero material from Brazil was imported leading to the development of the “Surinamese trinitario”. There were booms and busts and many plantations gave way to coffee production. Some key actions to revive the industry in Suriname were discussed. Should or could cacao be grown in Moengo? – A question for another day. The art movement in Moengo is largely driven by Marcel Pinas of Tembe Art Studio who erects large works of art en route to Moengo. He organizes the Moengo festival and brings international artists to Moengo as well as encourages the talents of some of the youth in the area. Art may be a means of promoting economic activity in the area but may also be valuable tool in soothing old wounds in a post-conflict society. The possibility of building an artsy playground for children in the area is an old idea of his which is now given new life. The Cottica river was used to ship bauxite and several Maroon villages have thrived along its banks. Asking the permission of the “Captain” of the village is protocol and “tourists” are genuinely warmly greeted. The agricultural and forest/wetland biodiversity is diverse. Tamarin, the Ndyuka Maroon village, is also the site of the abandoned Catholic boarding school which is being examined for its potential for restoration. Towns based on a primary industry often fade away when the industry is gone. Private companies can easily extract themselves but communities die a slow and painful death. The Plan4Cure project continues with a new group of students and it is hopeful that the plans designed with the local community are implemented and can lead to renewed prosperity. Lessons learnt at Moengo can also be applied to other parts of Suriname and perhaps the Caribbean which also face uncertain economic times.